In a single browser window, Google Cloud Shell only lets me have one instance that is not corrupt. Screenshots explain. Is there something one can do using Firefox 57 Quantum on Windows 10 or Firefox ESR 52.5.0 on CentOS6 to have multiple google cloud shells that are actually useable? Resizing text in one "tab" may fix corruption in that tab at the cost of corrrupting the other tab. 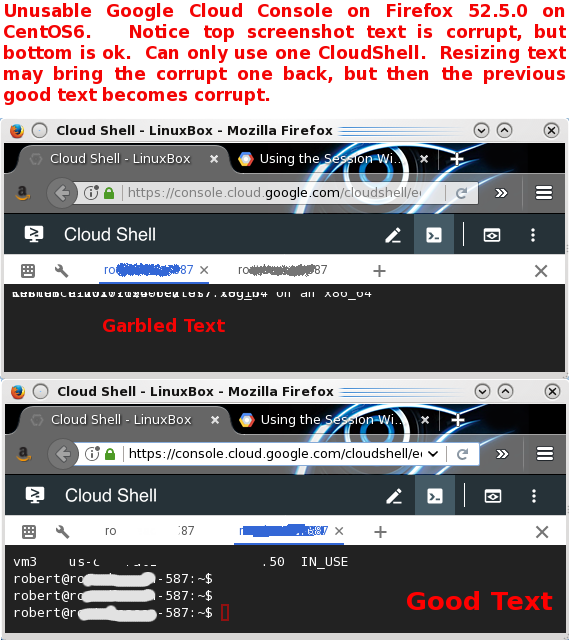 You can try running Cloud Shell in safe mode by appending cloudshellsafemode=true to the URL. Sometimes running browsers in incognito mode helps prevent some browser extensions to cause unintended behavior. Not the answer you're looking for? Browse other questions tagged google-cloud-platform google-compute-engine firefox google-cloud-shell or ask your own question. How to mount drive at Google Cloud (Google Compute Engine)? why does wget timeout at PASV on ftp sites with google cloud shell? how to write on google cloud storage from instance?